This iteration of the Nike SB Dunk Mid comes constructed in a hairy suede upper as a nod to the hybrid strain of Cannabis. Its features a Sail and Mint Green upper with Gym Red accents on the Nike Swoosh and other branded areas as well as the outsole. A droopy-eyed “White Widow” spider graphic insole completes the design, which is used on the matching apparel and skate gear. Look for the Nike SB Dunk Mid “White Widow” to pre-release on April 14th exclusively at Familia Skateshop followed by a wider release on April 20th at select retailers and Nike.com. The retail price tag is set at $100 USD. 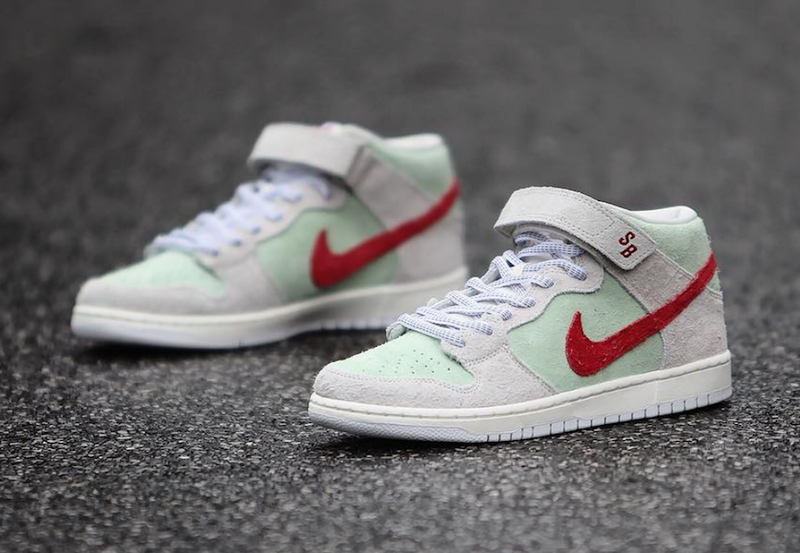 UPDATE: Detailed photos of the “White Widow” SB Dunk Mid via GC911. UPDATE: Nike releases official photos of the “White Widow” SB Dunk Mid.